Dams are an important part of our infrastructure and provide us with many benefits, including water, power, flood control, and recreation. 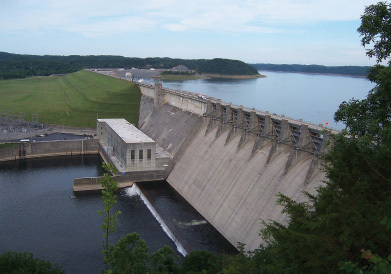 The National Inventory of Dams shows that in the United States alone there are more than 82,600 dams. The Association of State Dam Safety Officials (ASDSO) reports that over 3300 of these dams are classified as deficient (meaning they are susceptible to failure). Close to 17% of the dams in the U.S. are classified as having high-hazard potential—meaning failure could result in loss of life. These numbers highlight the importance of effective maintenance and upkeep of dams to ensure safe and reliable operation. Fortunately as dams have increased in number and age, tools for facilitating their maintenance have also increased in capability. 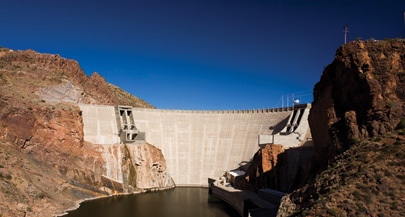 Automated monitoring systems have become an important part of many dam maintenance programs. These systems usually consist of sensors, dataloggers, and telemetry equipment that work together to measure critical parameters and provide data logging, reporting, control, and alarms. Data can be logged over time to provide information regarding the effects of aging, earthquakes, erosion, storm events, and other variables on the overall health of the dam. Alarms and callouts can be programmed to warn engineers of potential failures. Most important of all, these systems provide 24/7 monitoring and allow detection of many changes that could otherwise go unnoticed. Common causes of dam failure include overtopping, foundation problems, structural problems, and piping (internal erosion due to seepage). With an effective monitoring program, these causes can be detected early and repaired or mitigated. Due to the number of factors involved (hydrological, geotechnical, structural, and power related), a wide variety of measurements are required for dams. These cover everything from the structure of the dam, to the dam's foundation, to the water in the reservoir. Learn more about seepage monitoring at Wolf Creek Dam near Jamestown, Kentucky. Over the years, our monitoring systems have provided reliable solutions for all types of dams—embankment and concrete, new and existing. A number of factors have contributed to the selection of Campbell Scientific systems. Our systems are flexible enough to measure the wide variety of sensors used in dam monitoring applications. Their low power requirements and rugged design allow them to operate unattended in harsh environments for long periods of time. Telemetry options provide real-time data and alarms to assist in remote management. 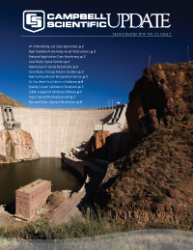 We've also released a number of products in recent years that facilitate dam monitoring. The AVW200 is a measurement interface that eliminates external electromagnetic noise that often plagues vibrating-wire measurements. The CS450 is our new submersible pressure transducer that provides measurement accuracy to .05%. Our new RF450 radios provide long-distance transmission ranges without the need for an FCC license. The AVW200 is an interface that eliminates the effects of external electromagnetic noise on vibrating-wire measurements. With over 40,000 dams that are 50 years old or older, the need for reliable monitoring systems will only increase. We look forward to facilitating effective monitoring through product development and application support. Don't hesitate to contact us if you have questions about your dam monitoring application.